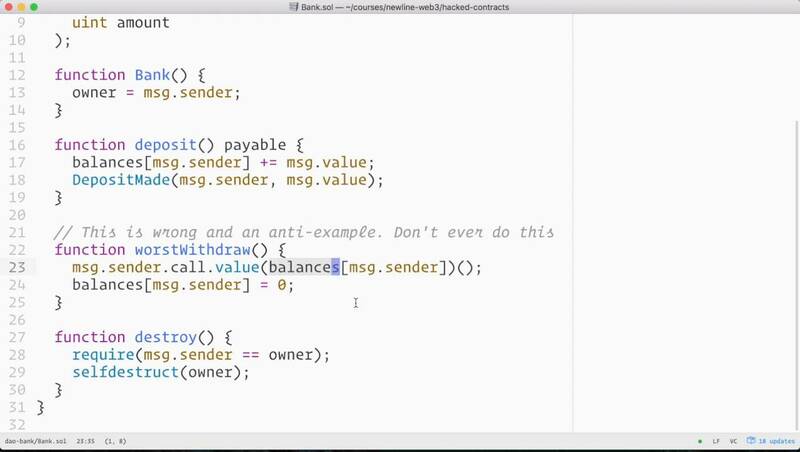 In the first line of this withdraw function, there are a lot of implicit Ethereum runtime features being used. Let’s unpack them. Remember that msg.sender is the address of the account calling this transaction. Also balances is our Bank‘s internal accounting that keeps track of the amount of deposits credited to each address. So far, so good. But what about .call.value and the extra parenthesis at the end? What’s going on here? In one sense, this is similar to calling .send or .transfer. We often think of there being a human at the receiving end of a send, but in Ethereum this doesn’t have to be the case! That is, contracts can send funds to other contracts and contracts can call out to invoke other contracts.